A fantastic new British-bred Wallflower that will reliably give you displays Autumn and Spring! It will flower this autumn around November, overwintering to flower again in the Spring! This dwarf variety is highly fragrant, as well as providing a rainbow-like mix of coloured blooms. Very hardy and will easily deal with wintery conditions, perfect for borders or containers. 'Sugar Rush' is a fantastic new British-bred Wallflower that will reliably give you two displays of vibrant colour to brighten up your garden this Autumn and Winter! It will flower this autumn around November, overwintering to flower again in the Spring! 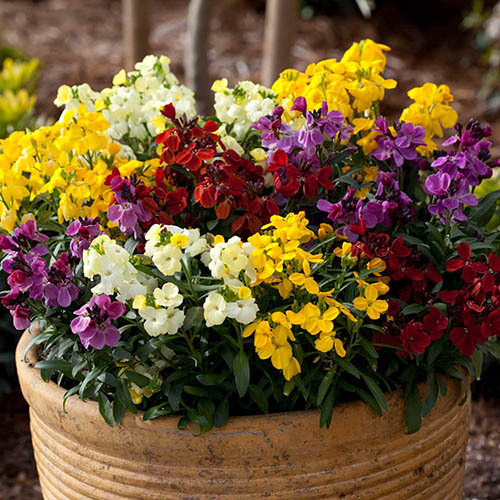 This dwarf variety is highly fragrant, and its rainbow-like mix of coloured blooms will provide a vivid display in the otherwise dreary winter months. It is very hardy and will deal with wintery conditions no-problem, and is perfect for borders or containers. Growing to about 20cm tall, it's mass of fruit salad shades will work best in full sun or light shade, in massed plantings in pots, planters or mixed borders. Remove spent flowers to prolong displays. Supplied as a tray of 20 garden ready plants ready to plant straight out or repot – mixed colours.